Figure 1: Upon exchange of H vs. D from H2O to D2O (the more "classical" molecule) the coordination tetrahedron shrinks. The distance of non-bonded water remains almost the same. Figure 2: Isotope quantum effect as a function of temperature. (a) Sx(Q) for H2O-D2O at (from top to bottom) 45, 35, 23, 15, and 6 °C with error bars. (b) Average size of the isotope induced structural change. Figure 3: H/D substitution is dominated by librational effects (left) while 16O/18O substitution affects mainly translational degrees of freedom (right). Water is the most important liquid on earth and it may be surprising therefore that water still keeps some of its secrets. The average static properties of a system of molecules, such as pressure or the average structure, should at a given temperature not depend on the total mass of the molecules or the mass distribution if the interaction is classical. Contrary to that expectation, isotopic forms of water, D2O and H218O exhibit different static properties and a different static structure. These structural differences have been investigated. Simulations indicate that the observed changes are best interpreted as decrease in size of the hydrogen bonded tetrahedron with increase in mass. 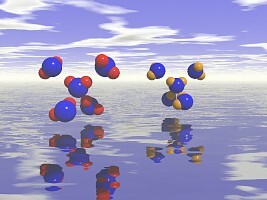 The distance of non-bonded water molecules relatively close to the central molecule remains in contrast almost constant. The result of a classical simulation of interacting particles is independent of the mass of the particles or the mass distribution within the particles. However, quantum effects can be taken into account in molecular dynamics simulations in the Feynman- Hibbs (FHMD) path-integral and with the Car-Parrinello (CPMD) formalism. Although those simulations qualitatively reproduce the measured structural isotopic quantum difference, there is a large variation of its magnitude in different calculations. Furthermore, an existing FHMD simulation has predicted that there is hardly any change in the magnitude of the difference between the X-ray radial distribution functions of light and heavy water between room temperature and the boiling point. Measurements of the X-ray scattering from H2O and D2O done at the wiggler beamline BW5 at HASYLAB show that the isotope induced effect depends fairly strongly on the temperature and is about a factor 2.5 more pronounced at 6°C than at 45°C. Within the temperature range of the experiment the isotope effect is well described by a 1/T dependence. Different from X-rays, the scattering strength of neutrons depends in general on the isotopes present. In fact, in neutron scattering the argument is commonly turned around: Since the structures of H2O and D2O are very similar, the different scattering strength of the isotopes can be used to extract information on the structure of specific atoms. Experiments like those described here allow quantification of this approximation. Such corrections seem important, especially at low temperatures. In a separate experiment carried out at beam line, BL04B2 at SPring-8 the effect of substituting the oxygen isotope 16O by 18O was measured. The total mass change from 16OH2 to 18OH2 is the same as from 16OH2 to 16OD2 but the mass distribution is different. The O atom is nearly at the center of mass of the molecule. The effect of substitution at the proton sites (D for H) is therefore dominated by librational molecular movements, while hindered translational motions contribute the prevalent effect in 16O/18O substitution. The structural isotope difference for the 16O/18O substitution is found to be approximately one quarter of the magnitude of the observed H versus D effect. The experiment shows that the 16O/18O substitution effect is small and limited to the first shell, while a simulation has predicted large structural rearrangements in both the first and second shells. The scattering of high energy X-ray available at beam-line BW5 have allowed conducting a series of experiments to quantify the structural differences between different isotopic compositions of water. These experiments allow testing various formalism aimed at incorporating quantum effects into molecular dynamics simulations. They quantify the argument commonly used in neutron scattering that the structure of isotopically modified liquids is similar. Temperature dependence of isotopic quantum effects in water R. T. Hart, C. J. Benmore, J. Neuefeind, S. Kohara, B. Tomberli, P. A. Egelstaff Physical Review Letters 94 (2005) 047801. Isotopic substitution effects in water structure measured with high energy photon diffraction B. L. Tomberli, C. J. Benmore, P. A. Egelstaff, J. Neuefeind, V. Honkimäki J. Phys. : Condens. Matter 12 (2000) 2597.